If there’s one thing this particular split has confirmed to me, its that 1) crossover thrash remains strong, and 2) that proper punk rock music is still well and truly alive. At first glance it would seem these two bands shouldn’t go together – Falmouth, Cornwall’s Rash Decision’ are fun, but aggressive all the same, while 2 Sick Monkeys are those cheeky chappies who just want a laugh and a riot while jamming out punk grooves. But the recent touring buddies act as a yin and yang to one another. ‘Less is More…More or Less’ was released earlier this year, and if you haven’t chanced upon it yet, now is an excellent time to get on board. Rash Decision’s side consists of eight coastal themed tracks that are quickly blasted out, with a couple of lengthier tracks that fans of Municipal Waste, SSS, Lifeless et al should have no problem digesting. It’s fast and raucous, blitzing through their portion of the split fairly quickly until the last two tracks which resemble slightly more traditional thrash compared to what preceded it, those still brief, with ‘Temporary Worker (Clause 4.1)’ padded out with a tannoy announcer through the majority of its duration. By contrast, the bass & drum punk duo of 2 Sick Monkeys produce a masterclass in punk rock that proves its true spirit is still alive beneath the hordes of false libertarians and fashionistas with thirteen tracks that the guys blitz through. 2SM aren’t new to this game, having been around since 2000, and lyrically its nothing exactly groundbreaking, but you should be singing along to all of it when its done. Every brief split in the music is the cue to go nuts, whether it’s the surf-punk tendencies of ‘Blurrr’, the venom of ‘Bullshitter’ or ‘I’ve Had Enough’. The more spit-laden tracks are balanced out with some general boisterous tracks like ‘Sayonara’ and ‘I Love Booze’. Most of the tracks are a few years old but they sound fresh, chunky and full of verve all in one, without losing that punk spirit. 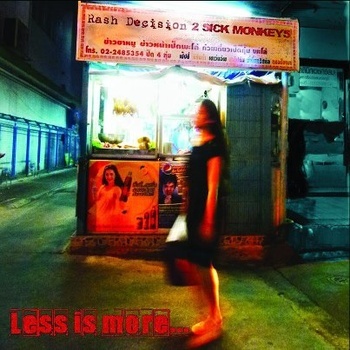 ‘Less is More…More or Less‘ is released through Pumpkin Records in association with Riotska Records, Smegma Records, Side Effect Records and Atomsmasher Records.